Concert/Festival Loading Dock & PA Wings for rent from Stage CMDR, Inc.
Every concert/festival needs some sort of loading dock to stage all the lighting and sound equipment before and after set up. This makes for super effeciant unload and load of all the gear from the trucks. These docks can be confirgured to any size, any height, with or with out ramps, and attached static or removable hand rails. Most mobile trailer stages can only pack a certain amount of extra stage decks to increase the size of stage or create a small PA wing. In most cases the loading docks are subbed out to a company like Stage CMDR to provide the stage deck re-enforcement to build a loading dock and or PA Wings. PA Wings are wings that are on the left and right side of the main stage itself. These mainly serve as a staging area for green rooms, all the audio equipment for bands, a staging area for the rolling drum risers and lounges for backstage prep areas for equipment or the band members themselves. 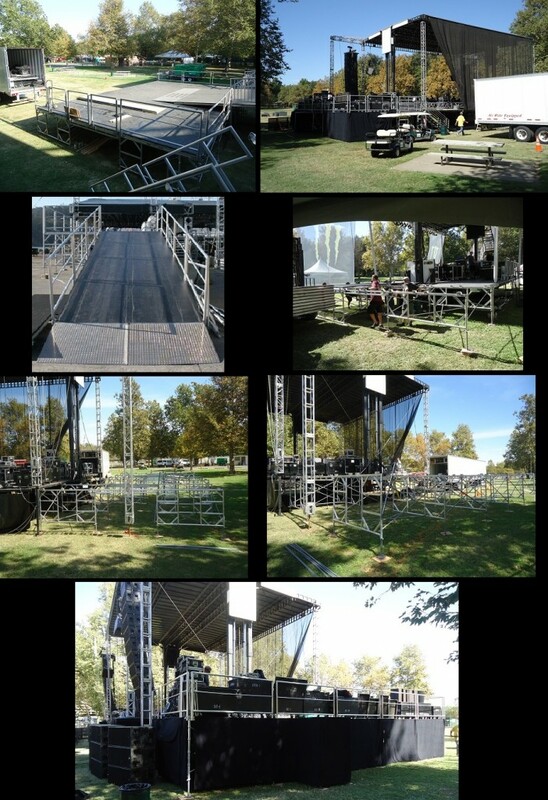 Both PA wings and loading docks are a must for large scale concerts/festivals and even small ones as well.